Paul Rutherford (born 14 February 1970) is a Scottish powerlifter. He was the 2010 World Unequipped Powerlifting Champion. Born in Glasgow, Scotland, he developed meningitis as an infant which severely affected his immune system and stunted his growth. As a result he was short and very underweight as a child. Rutherford began weight training after being bullied at school. In 1985, aged 15, and at a body weight of only 79 pounds (36 kg) he took up the sport of powerlifting. He competed as junior lifter until 1989. The 5 ft 6in personal trainer won 11 championship titles from 1986 to 1990 but then retired. In March 2007 he promised his nine-year-old son he would make an improbable comeback after watching the film Rocky Balboa, starring Sylvester Stallone, which was all about Rocky being older but making a ring comeback. In 2007 he achieved a silver medal at the European Powerlifting championships, and then bronze at the 2009 World Championships. 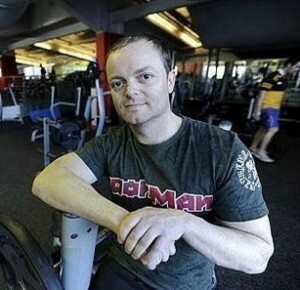 In 2010 he finally achieved his dream of becoming World Powerlifting Champion at the age of 41. He again won the World Championships for a 2nd time in November 2011. His Daughter Hayley Rutherford (15) and his son Ryan Rutherford(14) also won their respective divisions at the World Championships.